For fun, for celebrations or to mark all life's special occasions, treat yourself and your friends to an exclusive afternoon tea party prepared to your personal requirements, brought to your home and served by us, the Pinnies and Pearls ladies. We are three friends who love baking and making occasions really special. Tea parties with an extra sparkle! We are experienced in catering for everything from birthdays, christenings, hen parties to weddings and wedding anniversaries. We also provide suitable catering for funeral teas. We are enthusiastic and thorough about everything we do and always deliver to the highest possible standards. Just tell us your requirements and we will do the rest leaving you time to relax and entertain your friends. To get in touch either give us a call or contact us online and we will get back to you. Using only the finest, freshest ingredients we can serve perfect afternoon teas at your home or at your event. Enjoy an array of delicious finger sandwiches, savouries, scones and individual cakes baked especially for you. Choose from our Classic afternoon tea or our more savoury Gentleman's tea. With our vintage mis-matched bone china teacups and plates, silverware and embroidered table linen we will create an individual and charming setting for you to enjoy that special occasion. We can also offer extras to suit your event. Would you like your tea-leaves read so you'll know your future happiness and success? Or perhaps a quiz to keep the mind sharp? Or how about a lively presentation on the story of tea with a demonstration of how to take afternoon tea Downton Abbey style? Some of our customers like to delve into our small dressing up box and take photos through our gilded frame! If any of that sounds like fun, we would be happy to make your party even more special, just let us know. To celebrate the Tour De Yorkshire 2019, Pinnies and Pearls will host its first ever pop-up cafe for families, friends and spectators. Come, relax and enjoy tea, cakes, sandwiches and more as the cyclists race by. Everything is tailored to your needs to ensure the success of your celebration or event. A free planning consultation is included in the price. Finishing touches before the guests arrive. We are three friends who love baking and making occasions really special. With impeccable service we pride ourselves on providing an individual service to meet your needs. "I just wanted to say a big thank you for making our wedding day so enjoyable! Everyone loved your tartlets, sandwiches and cakes, we received many positive comments. My mum has asked me to pass on her compliments, she particularly liked the rose water and pistachio cupcakes - they were 'gorgeous'! My favourite was the lemon cupcakes and Dan really enjoyed the mini cheesecakes - his absolute favourite cake!I also appreciated your efficiency with replenishing the cakes and appreciated your assistance with the toast. I will certainly recommend you!" Heather, Bradford, April 2016"
"Thank you so much for everything yesterday. Everyone was so complimentary of your service and had throughly enjoyed their afternoon tea. Thanks again for making Chloe's 21st so special." Gill, Tadcaster, August 2015"
"My sister and I were looking for the right people to cater for a special tea party to celebrate our mother's 90th birthday. Vicky and Clare came to discuss it and we were most impressed with their approach and expertise, but that was nothing compared to their professionalism on the day. The immaculate table settings with beautiful china, silver, flowers and embroidered lace table linen, presentation and taste of the food, extra details such as jasmine or mint tea served after the main event, gingham bunting to decorate the entrance, the immaculate state of my kitchen after they had finished, all contributed to making the party unforgettable and very elegant.We would have no hesitation in recommending Pinnies and Pearls to anyone looking for caterers to make a special event, one which they and their guests will remember for a long time." Dianne and Angela, Scarcroft, March 2014"
A 20% deposit is required to secure a party. Final payment is due upon completion of the party. We are based in Harrogate and cover the York, Leeds, Bradford, Ripon, Wetherby, Ilkley and Otley areas. How large can a party be? 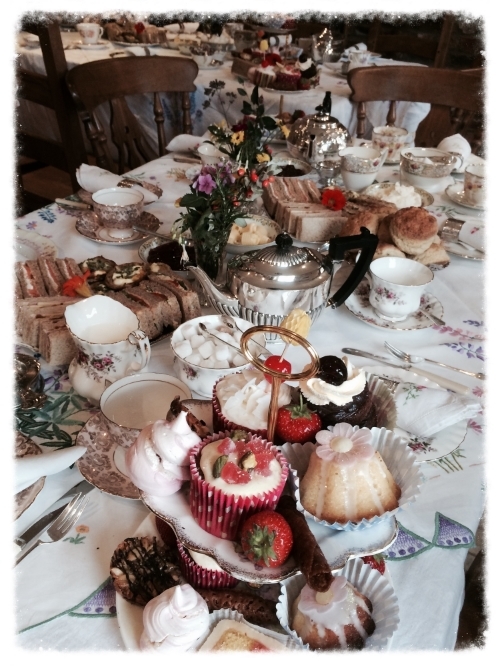 We can cater for as few as twelve locally or for up to 130 for vintage tea parties. You will be contacted seven day before the scheduled party date. At that time we shall require a final head count and your final bill will be based on this number. Please include a list of allergies or special dietary requirements at this time. The 20% deposit is non-refundable, however we will be more than happy to reschedule your party provided you give us more than 7 days notice prior to the original booked date for your party. We are very proud to be rated five out of five for food hygiene by Harrogate Borough Council. Our latest inspection and certificate was on 20th March 2019.